Chances are that you would like to track your operators performance in your tattoo studio. Check out these easy to follow steps on how to set up your operators Key Performance Indicators, and how you can keep an eye on how well they are performing in the studio. Setting up your Operators KPI's. To create a new operator go to Admin, then to the Operators tab, and click New. A box titled Operator Details will open up on the right side panel, where you can fill in the Operator Details (Display Name, Display Order, First Name, Surname, DOB, Gender and Operator Level) and Save. Note: Next to Contact Details, Postal Address, Commission Details, Security, KPI Details and Online Booking there is a plus sign. Click on the plus sign (+) to open up these boxes further. Now we want to set up the operators KPI's. Expand (+) the KPI Details. Clients Per Day: On average how many clients per day the operators needs to see. Avg Client Spend Per Day: The average amount of money a client spends per day. 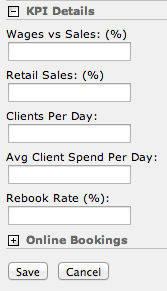 Rebook Rate (%): The average percentage of clients an operators has rebooking their next appointment. Once you have entered all the KPI Details, you can Save. Now you can use the Operator KPI Report to track an operators performance. Go to your Reporting page and click on the KPIs tab. What you will see now, next to the list of your operators, is a break down of each KPI target and if the operator is/is not achieving this. You can see next to Barry, for example that his Wages vs Sales figures are in Red, that means that he is below his target of $200, and has currently not met this KPI. Once he meets the KPI is will change to Green. Note: The Simple Inked System, calculates the Wages vs Sales KPI through the Roster, so make sure that each Operators working hours and salary/wage information is correct.